We conduct our passenger satisfaction survey on a biennial basis to gather input from riders on their perspective on our services. Surveys will be made available online at DCTAsurvey.net, at our Downtown Denton Transit Center (DDTC) on board DCTA vehicles. The print and online survey will be available in English, Spanish and the Hakha Dialect of Chin. Riders can return completed surveys to a DCTA representative, bus or rail operator or the ticket counter at the DDTC. Survey results will be presented to our board of directors at the June 2019 board meeting. There are so many great events, free ride promotions and ways you can get involved with DCTA this month! 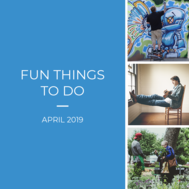 From riding free to the 2019 Thin Line and Denton Arts & Jazz Festivals and coming out to our “Rails to the Trails” event to celebrate our A-train Rail Trail, check out all that’s happening at DCTA this month. Keep calm, spring has arrived – and fun events are sprouting around North Texas all month long! From fun festivals in the springtime air, concerts showcasing music from all over or events that speak to your artistic abilities, you can attend many fun outings around North Texas with our help! If there’s one thing Denton resident Cynthia Grady doesn’t like, it’s traffic. That’s why she rides DCTA! She hops on our A-train and the Denton Connect Bus system and lets us do the driving so she can relax. Find out more about Cynthia and why she likes to #RideDCTA by visiting our Hop on Board blog.